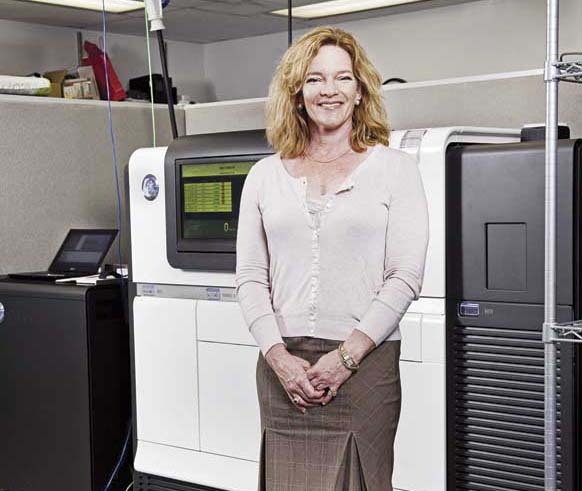 Decoding cancer: Elaine Mardis uses sequencing to study the genomes of diseased cells. In the fall of 2006, a new machine arrived at what’s now known as the Genome Institute at Washington University in St. Louis. It was capable of reading DNA a thousand times as quickly as the facility’s earlier machines, and at far less cost. Elaine Mardis, the center’s codirector, immediately began using it to sequence cancer tissues, scouring their DNA for mutations. Just five years later, Mardis and her collaborators have sequenced both cancerous and healthy tissue from several hundred patients and identified tens of thousands of mutations. Some of the findings have led to new approaches to treating cancer, while others have opened new avenues of research. In 2008, Mardis and her team became the first to publish the sequence of a cancer genome, derived by comparing the DNA of healthy and cancerous cells in a patient with a bone marrow cancer called AML. Further studies have suggested that patients with mutations in a particular gene may fare better with bone marrow transplants than with traditional chemotherapy, a less risky treatment that physicians usually try first. Mardis predicts that soon all AML patients will be genetically tested, allowing their physicians to make more informed decisions about treatment. As the cost and speed of DNA sequencing have dropped—Mardis estimates that sequencing genomes from a patient’s cancerous and healthy tissue today costs about $30,000, compared with $1.6 million for the first AML genome—the technology is being applied to oncology more broadly. Research groups have now sequenced the genomes of multiple cancers, and in a handful of cases, they have used the results to guide treatment decisions for a patient (see “Cancer’s Genome,” January/February 2011). A few companies are now offering cancer genome analysis to researchers, and at least one is planning to offer the service to physicians and patients. Understanding cancer genomes isn’t easy. Mardis’s team had to invent techniques to distinguish the rare cancer mutations from the mistakes that routinely occur when sequencing DNA. And scientists must figure out which mutations are actually driving the growth of the tumors and which are harmless. Then comes what might be the most challenging part: determining how the mutations trigger cancer. Mardis says she is leaving that challenge to the scientists around the world who are working to understand the mutations that she and others have identified. “It’s really gratifying to see others pick that up,” she says. Great read. Is this rapid sequencing machine applicable in sequencing diabetes genes as well?